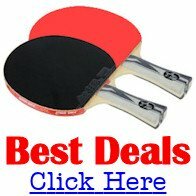 Is there an official table tennis rule dealing with time limits? Did you know that the rules of table tennis specify the amount of time you're allowed to take before and during a match? Well, actually it's the additional Regulations which deal with these specific issues. They specify ... the amount of time you're allowed to practice on the match table before you start ... the breaks you're allowed to take and how long they can be ... and how to deal with time-wasting. Need your questions about the Rules and Regulations answered SIMPLY and CLEARLY? Take a look at this fully up-to-date downloadable book. You'll find everything you need. Before we go any further, it's worth noting the difference between the Laws (commonly referred to as the rules) of the game and the Regulations. The Laws are the "basic" rules of the game and are mandatory for all sanctioned table tennis events, whereas the Regulations are supplementary to the Laws and are only mandatory for ITTF (International) events. However, the Regulations may also be used for non ITTF events and it is for the event organiser to decide whether they will use any or all of the Regulations. So, depending on the competition you are playing in, the Regulations may or may not apply. But as a general rule, the higher the level of competition, the more likely it is that some or all of the Regulations will be used in addition to the basic Laws. Regulation 3.04.03 states that you're entitled to practise on the match table for up to two minutes immediately before the start of your match. But as soon as you've finished your warm up period, you must start your match ... even if you don't use all of the two minutes you're allowed. You're also not allowed to receive advice or instructions from your coaches or advisers after your warm up period ... you must start your match immediately. One of the oldest regulations in table tennis is that "play shall be continuous". However if, for example, the ball goes outside the playing area, you obviously can't continue playing until it's returned. Therefore the intention of this regulation is to prevent deliberate time-wasting tactics. These include ... repeated bouncing of the ball ... long pauses before serving or receiving .... and prolonged discussions with your doubles partner. The umpire is required to firmly discourage all of these time-wasting tactics and issue warnings where necessary. However, this "continuous play" regulation has now been amended to allow for some authorised breaks in play. So what breaks are you now allowed to take once your match has started? Regulation 3.04.04 now states that play shall be continuous throughout an individual match ... except that a player is entitled to certain defined breaks. During a game there are two types of authorised breaks ... Towelling down and a Time-out. The umpire must ensure that these breaks are as short as possible so that players don't use them to gain extra rest time or deliberately try to disturb the rhythm of their opponent. Before the towelling down regulation was introduced, some players were towelling down after every point, particularly when their match was closely contested. Because this was being used as a blatant delaying tactic, this new regulation was introduced. However ... as the purpose of this regulation is to prevent you from using your towel as a delaying tactic, you are allowed to towel down at other times as long as it doesn't interrupt the continuity of play. For example, when the ball is being retrieved from outside the playing area. Also, if you wear spectacles, the umpire may allow you additional short breaks between rallies so that you can clean your spectacles. And, if you use reversed rubbers on your racket, you'll also be allowed to wipe off any sweat which gets onto them, as otherwise this will adversely affect your shots. 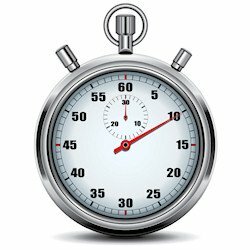 During an individual match a player (or pair in doubles) may claim one time-out period of up to one minute. Each player or pair (or their captain or adviser on their behalf) can claim this time-out by making a T-sign with their hands. However, this can only be claimed between rallies. The umpire will then suspend play and hold up a white card on the side of the player or pair making the request. A special signboard is then placed on the court of the player or pair making the request. 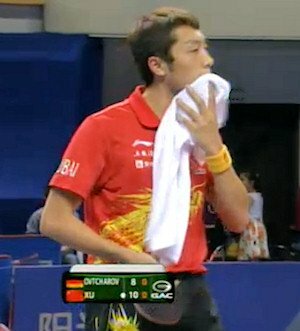 Play is resumed when this player or pair is ready to do so, or at the end of 1 minute, whichever is the sooner. 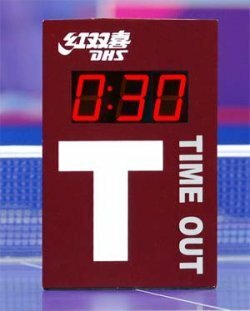 The special signboard is then removed from the table and a white marker is placed near the score indicator, next to the score of the player or pair who requested the time-out. But once a game has finished, is there a regulation which allows any time before the next game starts? If you're playing a match (which is usually the best of 3, 5 or 7 games), you're allowed to take a maximum break of up to one minute between games. But, if you don't take all of that one minute, you can't claim extra time at the next interval. Although you don't have to take a break between games, if any player wishes to take it, it must be allowed. If you do take a break, you must leave your racket on the table during the break and you mustn't remove it without the specific agreement of the umpire. If, with the agreement of the umpire, you remove your racket for any reason, the umpire and your opponent must be given the opportunity to inspect your racket, or its replacement, before the next game starts. But what about team matches? Is there a regulation dealing with this? If you're playing a team match, your team-mate has to start his or her match as soon as yours has finished. However, if the same player is required to play in successive matches, he or she may claim an interval of up to five minutes between those matches. During the course of a match there are a number of reasons why the umpire or referee may allow you to take a break. If you are temporarily incapacitated by an accident - and provided that in the opinion of the referee the suspension isn't likely to be unduly disadvantageous to your opponent - he may allow a suspension of play of up to 10 minutes in order to give you time to recover. However, you're not allowed to have a break for any disability which you already had (or could reasonably be expected to have) at the beginning of the match, or for reasons related to your state of fitness. So this means that you can't have a break for things like cramp or exhaustion, but you may be allowed to take a break if you're incapacitated as a result of an accident, for example, an injury caused by a fall. However, once you've been granted a break to recover from an injury, no further breaks will normally be allowed during that match ... except .... where the first interval was very short, another brief interval may be allowed for treatment provided that it's not likely to be prejudicial to your opponent and that the total period for which play is suspended during the match doesn't exceed 10 minutes. A game must be suspended immediately if anyone in the playing area is bleeding. And you can't resume until that person has received medical treatment and all traces of blood have been removed from the playing area. If the table, net or ball are damaged or broken, replacements will be made and/or play will be transferred to another table. The same applies if the lighting fails or if there's a serious disturbance to the playing area. However, if your racket is damaged, you're not allowed to have a break in order to fetch a new racket. You must have a spare racket with you. Are you allowed to leave the playing area during a break? If you take a break in accordance with these regulations, you have to remain in or near the playing area except with the permission of the referee. During intervals between games and for time-outs, you have to remain within 3 metres of the playing area, under the supervision of the umpire. What size is a table tennis table? 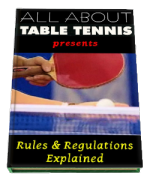 Do you know what the official rules say about the size dimensions of a table tennis table? What do the rules say about your racket? What do the rules say about the serve? When is the ball in or out? What do the rules say about playing doubles? What do the rules say about volleying the ball? Are players allowed to take breaks during matches?